Loreta Janeta Velazquez, b. 1842 and C. J. Worthington, Edited by The Woman in Battle: A Narrative of the Exploits, Adventures, and Travels of Madame Loreta Janeta Velazquez, Otherwise Known as Lieutenant Harry T. Buford, Confederate States Army. In Which Is Given Full Descriptions of the Numerous Battles in which She Participated as a Confederate Officer; of Her Perilous Performances as a Spy, as a Bearer of Despatches, as a Secret-Service Agent, and as a Blockade-Runner; of Her Adventures Behind the Scenes at Washington, including the Bond Swindle; of her Career as a Bounty and Substitute Broker in New York; of Her Travels in Europe and South America; Her Mining Adventures on the Pacific Slope; Her Residence among the Mormons; Her Love Affairs, Courtships, Marriages, &c., &c.
Secret service -- Confederate States of America. 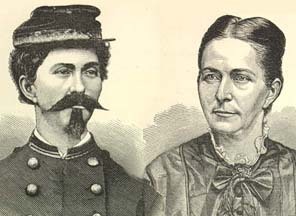 Spies -- Confederate States of America -- Biography. United States -- History -- Civil War, 1861-1865 -- Secret service -- Southern States. Velazquez, Loreta Janeta, b. 1842.